Margaret Thatcher meets members of the Coldstream Guards in the mid 1980s. Independent republican councillor, Gary Donnelly, has delivered a scathing anti-eulogy on the controversial former British Prime Minister Margaret Thatcher on the sixth anniversary of her death. "'The Iron Lady?' More like a heartless hag. The media portrayed this woman as some type of strong role model for women and they couldn’t be further from the truth," he blasted. 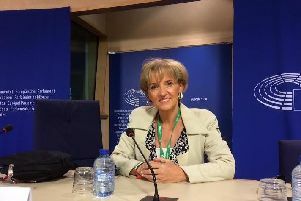 Councillor Donnelly, who is seeking reelection in The Moor District Electoral Area (DEA) in the elections to Derry City & Strabane District Council next month, lambasted the former Conservative Party leader, for her radical liberal economic policies and her government's record in Ireland. "The real strong women are those who stood against her and the might of the establishment and those still battling against the effects of her policies. "The wives of miners who lost their livelihoods, the wife’s of political prisoners running homes without a husband, the mothers of children killed by plastic bullets and women now struggling to keep families as they face the effects of Thatcherite policies. "They are the strong women. Thatcher couldn’t have done any of that," he stated.